The 2017 ASER report focuses on 14 to 18-year-olds, interviewing over 30,000 children across 28 rural districts. The Indian Express explains some of its findings. Explained: What is Sadhvi Pragya Thakur’s connection to Hemant Karkare? It has been eight years since the Right to Education (RTE) Act came into force in 2010, making elementary education a fundamental right for those in the 6-14 age group. Therefore, the 14-year-olds in the 2017 ASER (Annual Status of Education Report — Rural) survey are among the first to have benefitted from the Act’s provisions of no-detention and free and compulsory education. 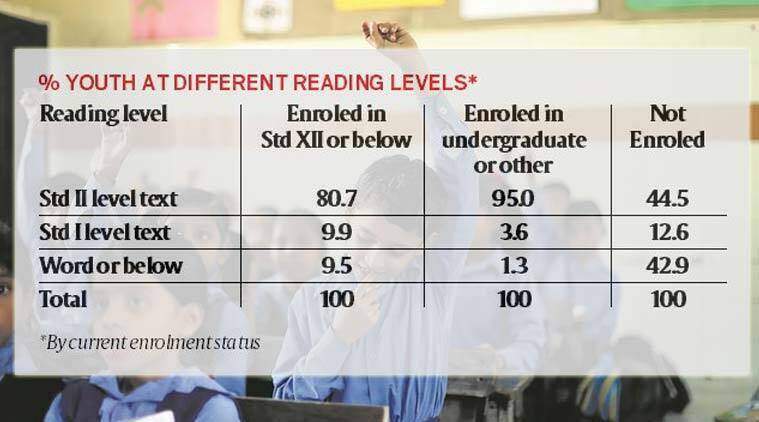 As the ASER report shows, a direct consequence of the RTE has been that most tend to continue to stay within the formal education set-up, even after the Act folds up at age 14. 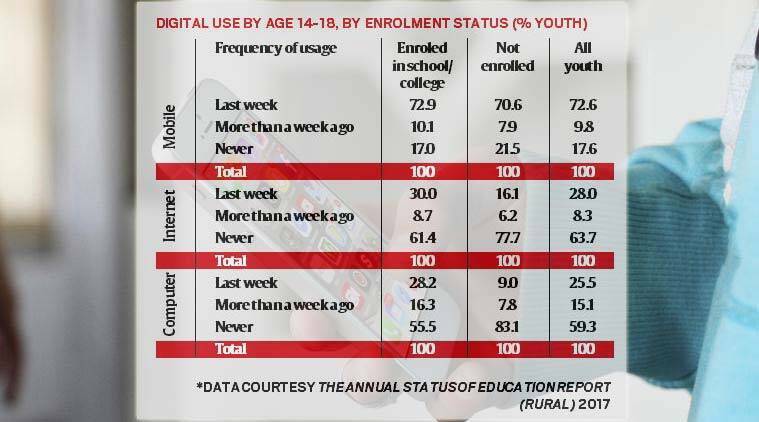 The data shows that at age 15, 92.1% of the children surveyed continued to be in school/college. 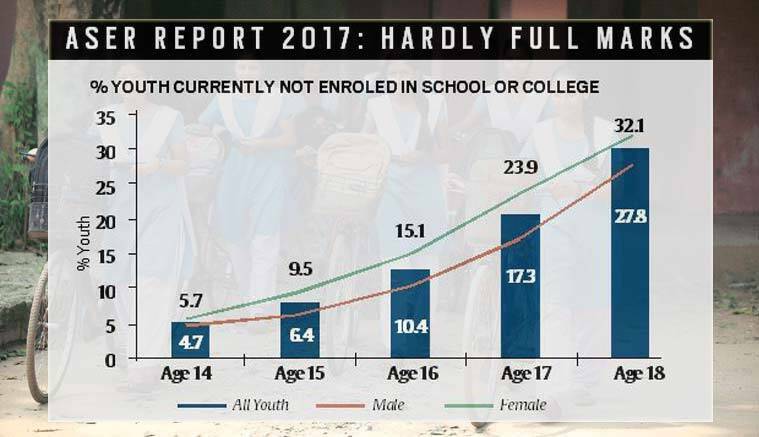 However, the enrolment gap between girls and boys increases with age — at 14, there is hardly any difference (94.3% enrolment for girls, 95.3% for boys), but at 18, the gap widens (71.6% for boys, 67.4% for girls). Though their ability to read in regional languages and English seems to improve with age, the same does not apply to math. The proportion of youth who have not acquired basic math skills by age 14 is the same as that of 18-year-olds. “This underlines what ASER has always been suggesting — that you need to have foundational skills in place in time,” says Rukmini Banerji, CEO of Pratham, the organisation that conducts ASER. Here too, there is a visible gender divide: while only 47.1% boys in the 14-18 group could do simple division (dividing a 3-digit number by a single digit), at 39.5%, girls fared worse. One of the tasks given was ‘adding weights’. The youth surveyed were shown a picture of weights — 1 kg, 5 gm, 50 gm, 500 gm, 200 gm, 200 gm — and asked how much this adds to in kilogram. Almost half of those surveyed — 44% — got it wrong. Even among those with basic arithmetic skills, only 76% answered right. 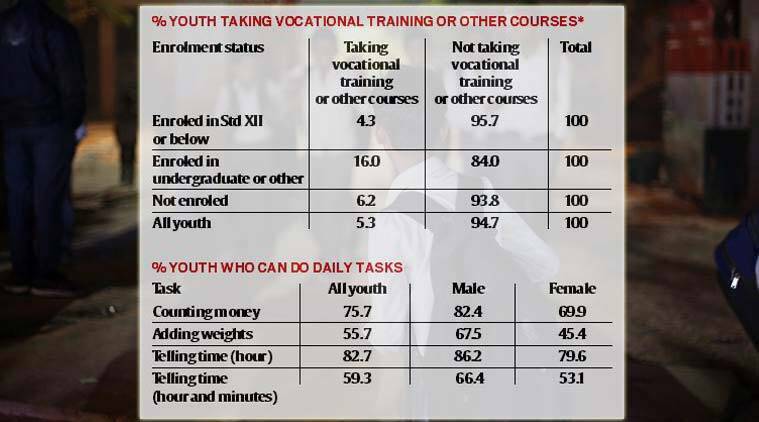 These findings are worrying because these are everyday skills that formal education has failed to equip them with. Besides, many of these students are the first in their families to complete eight years of schooling. About 44% of the age group had mothers who had never been to school, 25% had fathers who had never been to school and 20% had both parents who had never been to school. So, their ability to do basic calculations and make correct decisions is important not only for themselves but for the whole family. Here too, there are significant gender differences. While only 12% boys had never used a mobile phone, 22% of girls surveyed had never used one. Girls and young women have far lower access to computers and the Internet.